When lunch breaks are sandwiched in between work deadlines and demands, eating gets postponed and food often gets forgotten or misplaced. I think that’s how a small blue bowl ended up on top of the file cabinet, near the back window. Everyone saw the bowl up there, but nobody seemed to have the time or the inclination to do anything about it. As a result, it sat up there for quite some time, undisturbed. Maybe for a week or more, I’m not sure. “Wait! I have a camera! Don’t do anything until I take a picture. I think the mold is kind of beautiful…ummm…well…in its own way. Look at all the different colors.” (And yes, I am the one who said this). It’s been 9 years since then and everyone in that office has moved on to different jobs. Nothing stays the same. Life has changed, but the photo of the misplaced mold bowl lives on! 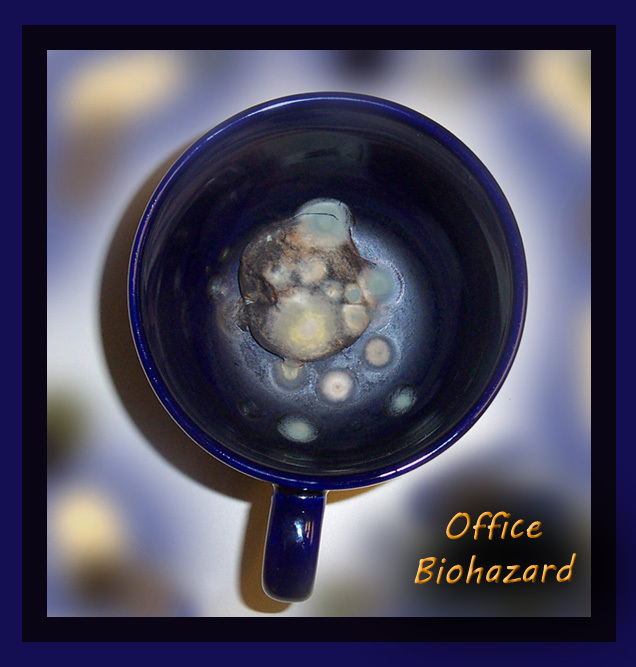 This entry was posted in Creative Writing, Humor, photography and tagged Mold, Work. Bookmark the permalink. Knowing that the contents had been cooked, and therefore were sterile to begin with, we can only conclude that what we see is evidence of what was growing in their mouth. I agree. Life was dissolving right before my eyes, mutating. Well worth a photo or two. You know…..some food still looks really good even when it is bad. At least this food, whatever it was, got fuzzy and changed colors so hungry, foolish people wouldn’t eat it. I admire honesty, even when it is not appetizing. There was an art video – time lapse sequence – of rotting fruit at the Tate Modern, may still be there. If it’s good enough for them….. The person that was upset about Biohazards is probably the same person that tries to collect $2 from everyone in the office to buy cake for someone’s birthday and then comes in with free home-made brownies. Ha ha! This is great. Living with two guys means I often find moldy cups of coffee under the sofa and bowls of sour milk and mushy cereal on top of the microwave! It’s pretty gross, but we do all have a good laugh at it. Oh…I have seen that too! Abandoned coffee mugs. One guy told me that he accidentally left a half-empty coffee cup on his kitchen counter at home. In the night, the milk and sugar in the coffee apparently attracted a few roaches, who fell down into his cup and drowned. When he found them floating there in the morning, he said he was totally impressed by how effective sweetened coffee is at catching roaches. The two worst desks/cubicles in any office are: 1) the one at the entrance, where you’re constantly interrupted by people coming in, and 2) the one by the refrigerator/microwave/coffee maker, where you’re treated to moldy bowls, unsavory odors, and continuous whining about people taking the last cup of coffee without making more. I agree. You are absolutely right about all of that! People do congregate in the kitchen and complain about things that they could quietly correct. Have you seen the sign that some companies place over the kitchen sink? Hmmmm….maybe that is why that guy volunteered to straighten up the office. And the plot thickens, or in this case, molds the perfect plan. Yes, I agree. It is icky! In fact, every time I look at it, I want to get some soap and wash my eyes. However, it is a perfect example of what happens when employees are expected to eat lunch while they continue to work. Lol…yes,..that’s a sobering thought. Love your line about washing your eyes! 🙂 Cracked me up! Oh my god, this is hilarious. Thanks….and it’s a true story! Importance is a relative thing. That misplaced mold bowl was of great importance among other things of lesser importance. It helped to bring a new spark of life (however moldy) into an otherwise routine work day. It caused people….who had buried their minds in paperwork…to actually stand up and communicate with others around them. It shocked us into awareness and brought us together for a brief moment in time (AND it gives me something to smile about even now). Long live the memory of the mold bowl! thanks for stopping by…nice pics here…. Good story! Thanks for the recent likes of my “At Rest” and “Turbulent Ocean” posts, Mary; appreciate it enormously!